Bitdefender is a famous computer security software company, it has some very good products that included anti-virus, internet security software. These software are commercial software, you have to pay for subscribe fee. Today, I like tell you a trick you can get BitDefender Total Security 2009 official registration code for free. Actually, this is a promotion activity with some PC magazines. Follow these steps you can grab it very easy. First, this promotion just for German resident, if you are not live in Germany you need use a proxy to fake German IP address. thank you for the registration of BitDefender Total Security 2009th You will be immediately emailed a license key for this comprehensive security solution to you. This extends the license period for a further 180 days. After that, check your email and grab registration code. 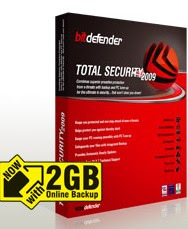 Download BitDefender Total Security 2009 and use that code install it, you will get 180 days to run this software for free.